Contest Alert: Win a getaway trip to Misibis Bay courtesy of NIVEA Sun! 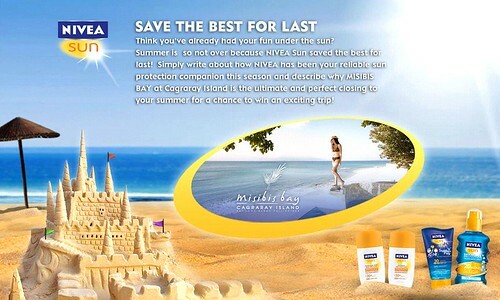 NIVEA Sun treats you to a sizzling hot summer-ender. Get a chance to win an exclusive trip for two to Misibis Bay at Cagraray Island. How NIVEA Sun has been your reliable sun protection companion in all your outdoor activities this season. You can write about NIVEA Sun Invisible Protection Transparent Spray or any of NIVEA Sun skin protection products, telling us how they/it protected you from the harsh rays of the sun and how you fearlessly had fun under the intense heat at any place you visited this summer. Kindly mention the travel advisor application necessary to be fearless under the sun (www.fearthesunnomore.com) in addition. Why MISIBIS BAY is the ultimate and perfect closing to your summer for a chance to win a trip for 2 to this luxurious island playground! For more information on Misibis Bay, visit www.misibisbay.com. Please link your entry to NIVEA for Women Philippines Facebook Page and send to czesca@rogue360.com for final compilation. The NIVEA-MISBIS BAY team will judge on the best blog entry submitted. Contest ends on June 17, 2011. On loose pants and losing weight. Not too long ago, I was one of those girls struggling to trim down the fat—literally. I used to weigh at most 125 lbs then, which actually falls on the normal range of my BMI (I’m about 5’4” btw). But, I was used to be slim and slender at around 110 lbs, and having a medium-large frame wouldn’t really work well with some of my extra small clothes. It was bittersweet to let them go when I gained weight. I got really conscious especially when people started to notice that I was getting fat. I guess it’s normal for women to hanker for their own ideal version of beauty, hence being aesthetically pleasing by having a pretty face and the curves to die for. I tried cutting down my meals into smaller proportions, but to no avail. I was afraid to take those slimming pills, lest they might rather get me seriously sick. I tried those Chinese diet pills before, when I was young and naive, but nothing happened I believe ‘coz I was still slim then (I know, BDD much). The safest that I could try was drinking green tea or acai berry. I couldn’t say if they worked or not, since it also dawned on me to start working out whilst taking them at the same time. Exercise—damn, this is one of the most intimidating words in the fitness dictionary. But alas, I succumbed for the sake of losing those extra inches and bulges. I started buying clothes of my present size. Of course, I hoarded for workout clothes. I was thinking about running, but Bikram yoga caught my attention. For that, I lost around 5 pounds after a couple of months of taking yoga classes. It was so darn hard, but worth it. The heat inside the room alone made me sweat buckets. How much more when the class starts? Most of the poses were quite challenging. It was difficult to be steady for about 30-40 seconds for a single pose. But, doing so religiously made them much easier to pull off. I really liked my teachers, especially Joy who owns the place. She was very diligent enough to teach yogis again and again on how to properly do this and that. After that, I went on for a breather (hopefully not a permanent one! ), just coz it was really hard and tiring. The summer heat of 2010 was a killer in addition. Ironically, every time I finish a class, there’s this extra zing that’s added into my system which keeps me energized for the rest of the day. Perhaps, that’s how exercise works. Aside from that, Bikram yoga has helped me increase my liquid intake. Basically, I’m now more of a water person than the food one. I still wanted to lose more. Fate brought me into a certain predicament (that is, wisdom tooth extraction) that made me lose weight further. During the healing period, it was so hard to eat, so I was forced to eat lesser than the usual. To boot, I was getting sick every now and then, mainly because of stress. Because of my illness, my weight plummeted down by almost 10 lbs! I’m back at around 111-112 lbs. Most of my medium-sized pants are quite loose already that I hafta wear a belt whenever I don them. Of course, I won’t recommend getting sick for the sake of losing weight. I was rather alarmed when those series of unfortunate events happened. Then, I remembered one thing: I’d never got sick when I was exercising regularly. Cheers to eating right and exercising regularly. It doesn’t only have to last all summer long. If you’re interested in Bikram Yoga and living in the north, I highly suggest Bikram Yoga Eastwood. For more info, you can visit the site here. Kate Middleton has been known for doing her own makeup during her engagement shoot, and she did it effortlessly great! 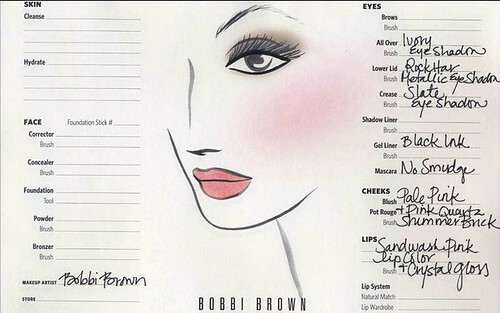 As to whether or not she did her own makeup during her big day, it’s been revealed that she’s an avid fan of Bobbi Brown Cosmetics.